This is a custom instrument made for me by Michael King of the UK. It's an Icelandic folk instrument called the langspil (which translates as long play, long bow, or long game). The oldest written descriptions of the langspil are from the 1700s. Langspils can be either bowed, strummed, or fingerpicked. My langspil is a traditional shape with a single bentsided bout, and three strings. The bass and middle string are open drones, while the single melody string runs over frets. I requested it be made with a distressed white paint finish and kolrosing designs of a viking ship, a whale, a reindeer, and other Icelandic symbols. It has a VSL of 29" and I've tuned it here (bass to melody) to: C G Bb, played in aeolian mode in C.
I just love its ancient melancholy voice, and it was fitting that it arrived to me in January... the majestic somber dead of Winter. Please excuse my very crude bowing skills- I've never held a bow like this to bow a table instrument- it's quite hard to get an even tone. I hope to get better results with time and practice, but I wanted to let my friends have a taste of this wonderful instrument I'm excited about. Better examples later! The Three Ravens is an English folk ballad, printed in the song book Melismata compiled by Thomas Ravenscroft and published in 1611, but the ballad is perhaps older than that. We haven't heard much about this langspil since you first got it. You certainly have that haunting ancient tone down already in this video. Have you continued playing it? How do you choose what tunes would work well? Lisa, thanks for sharing Three Ravens. I thought you did well. I appreciate you comment on playing with expression. Right on! And your comment on being happy to be an amateur home musician is spot on as well. It certainly echoes my approach to music. Thanks for that as well. The luthier Michael King in the UK is very talented and makes many types of instruments, such as lyres and crewths. This is the 3rd instrument he has made for me over the past 10 years- also a jouhikko and an epinette des Vosges last year. He is very creative and talented, but my favorite thing is that he will accommodate all the special requests I have for a particular custom instrument. He'll build to whatever scale size, string spacings, engraved or carved decorations, special finish... whatever I've asked him to do he has done and done it well. I think he finds it interesting the things I come up with. So when I work with him we go over every detail and exchange detailed drawings and lists of specs. The careful planning has always come out great in the end. For example, he had never done a finish like this one- distressed white paint made to look old, with 'kolrosing' cut designs on top of the paint. We also flipped the script by putting the softwood on the sides and bottom, and a hardwood on the instrument top, to accommodate the kolrosing better- he assured me it would not effect the sound badly. Cool! The pegs are Wittner geared viola pegs- so fine tuning is a breeze... delightful! :) It's the bowing that is the real challenge, but the compelling bowed sound is I think worth the work to get better at it. It's the whole reason I wanted this. I find the instrument and the musician fascinating. You play many instruments well. You have a much envied gift. thanks for sharing. (Oh, I'm going to build a Tennessee music box one day). Thank you Sam. The bowed sound of the langspil gives me the chills, too. I'm so thrilled to have this instrument! 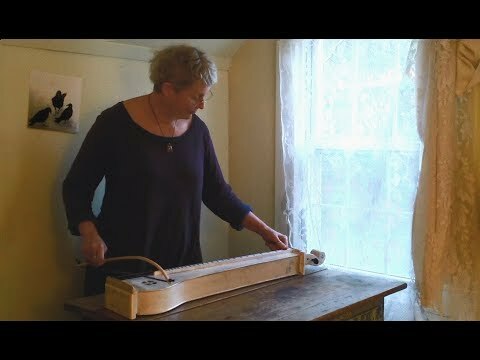 The only other instrument I can compare this haunting sound to is in a few existing videos of people bowing their Tennessee music boxes- another large 'table zither' that is wider than the langspil. The langspil is like a slender music box with a curved bout. I can certainly tune ionian to play cheerful tunes as well, and will be doing so. But right now, in the dead of winter, I have a whole slew of melancholy minor tunes I've been wanting to play for ages. They all sound better on this bowed langspil than on my other strummed instruments, so I'm going to be playing 'on the dark side' for a while. Hope folks can put up with it! Jeepers ... gave me chills! (Good ones) Knowing a little of the history of this particular instrument I'm so happy to see that the two of you have taken up so well. I had not heard a langspil bowed before. Love the deep, throaty voice. You all are very kind- thank you! Wow!! There's nothing like the sound of a bowed Langspil, to stir a music lover's heart. Thank you! That thing sounds extra good Lisa. And you can f'sure play it too. Strumelia, thanks for the link to the lyrics. I knew I should've bet on it! I can picture a passerby mesmerized by the silhouette in a window of a beautiful woman playing a haunting tune on an unknown instrument. I bet he is still there now, hoping she'll return and play some more . . . True drones do remind one of bagpipes however it is stronger with the bagpipe tuning. Perhaps it's that I haven't heard the langspil before. Very cool Strumelia! The drones are reminiscent of the bagpipes. Is that bagpipe tuning? I like this! The tune likely goes along with the story behind it (I don't know for sure, but I'd bet on it).